SheSoBad.com - On Wednesday, Aug. 22nd inside Analog Bar in Downtown San Diego. TreyPeezy.com will present his debut album entitled “BOON LEAGUE.” @DJArtistic will be hosting the festivities of this event, with no cover at the door and strong drinks at the bar. Please feel free to come out and support this magnificent occasion. 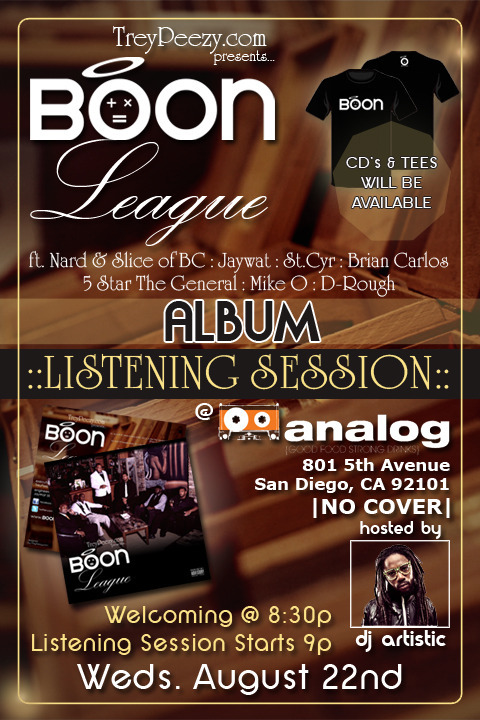 Featuring artist like, Nard & Slice of BC, St.Cyr, Jaywat, Brian Carlos, Mike O, 5 Star The General, D-Rough and more. Be sure to be there on time to get your ALBUM & TEE SHIRT! Drinks & Food specials all night.